It is very important to recognize and understand dog illnesses symptoms because it is always easier to treat if they are diagnosed early. Since your dog cannot tell you in words that he is not feeling well, you must note the changes in the behavioral patterns of your canine. Common illnesses among dogs are parasitic infestation, microbial infection, reaction to allergens and other case related to the inflammation of the skin. All these would manifest in less shine in the fur of your pet, eruptions on the skin and frequent scratching and licking of both skin and coat. Fill a 10 ml bottle with calendula oil and add 5 drops Lavender and 6 drops Geranium. Apply to affected areas. Our recommendation is FidoDerm Spray -- an effective way of treating these conditions. Additionally this is good for treating minor abrasions, skin irritation and sunburn as well. This spray is not to be used on cats. This infection can be caused by ear mites, allergy, or bacterial infection. The common manifestation of this condition is frequent scratching of the area and often shaking. Stop using eardrops and antibiotic if they aren't working. It's also important not to put anything into the ear if the eardrum is damaged. Try using 4 drops of lavender, 2 drops of tea tree, 7 drops of bergamot and 3 drops of Roman chamomile. Do not pour these essential oils in the dog's ear though. Try putting these oils in a spray bottle with 15 ml carrier oil. Spray the ear with the solution. Then, clean the ear with a cotton swab. Our recommendation product to prevent your dog from ear infections is Herbal Ear Rinse -- a preferred product to use in preventing these ear conditions. This all-natural agent is a better alternative to commercial synthetically produced chemicals. Make sure that this product is used during grooming schedules to help clean off wax and dirt accumulating in the ear. Also in cases of infection, this product is proven effective for treatment of those. Arthritis in dogs can occur at any age, not just old age. 1 in 5 dogs over the age of 7 contract some form of arthritis. Symptoms of arthritis in your dog are any noticeable change in your dogs mood and activity level. It affects the dogs joints, hips, shoulders, neck and back. This is also called degenerative joint disease. A tolerable moist heat may be applied on the affected areas. The warmth of this intervention will help decrease the pain. In the absence of the moist heat applicator (pad) you may just suit your pet with a warm sweater. And massage the area twice a day with the following blend to soothe the pain away. A massage will also be the perfect intervention on this type of condition. Use a blend of 8 drops of Juniper, 7 drops of rosemary and 12 drops of birch diluted in 10 ml of any organic carrier oil in a bottle. The massage may be done twice in a day to help ease the pain. And if your dog suffering from chronic joint inflammation, try our Alfalfa/Yucca Blend Extract --- Formulated by herbalists Gregory Tilford and Mary Wulff Tilford that is very effective in treating chronic joint inflammation. If that "tiredness" when walking appears in your dog at old age, you have to consider rheumatism. It can be a real torture! 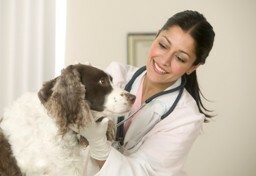 Rheumatism in both canines and humans affect the bones, tendons and the nerves altogether. It is difficult distinguishing this condition from arthritis that is plain inflammation of the joints. The intervention for this type of degenerative disorder is to try and ease the pain through massages. The recommended blend of essential oils are composed of 8 drops of birch and juniper and then 7 drops of rosemary essential oil diluted in a 10 ml bottle of an organic carrier oil. Dry skin is often a source of irritations, and the back is a common site for its occurrence. Mix a few drops of myrrh and patchouli together in a spray bottle. Either spray the mixture on the skin or if the dog will allow you rub it in. This mixture can also help in minor cuts and bruises. Try not to bath your dog more than once in a month. Use our dog shampoo -- a combination of essential oils based with jojoba oil the essential oils used has the natural plant based components that is effective in repelling fleas and other parasites. A dog supplement that can boost or normalize the immune system would help your pet avoid and fight these common dog illnesses. try our Vitality Blend Extract for boosting immunity and improving resistance to stress. Essential oils if applied topically are best placed on paws and ear tips. These body parts absorb the substance almost instantaneously. A couple of drops may also be applied at the back of your pet right along the spine and then massaged on the area. A diffuser may also be used but make sure that the essential oil is appropriate to the dog and exposure should not exceed more than 15 minutes if in a room. Although these recipes have been tested on dogs, an owner should always pay special attention after using it for the first time. Some dogs may be allergic therefore attention needs to be paid to any rash or other condition that may appear after usage. When in doubt, please contact your veterinarian for more information. K.L. Bell Holistic Aromatherapy for Animals (Findhorn Press, 2002). A.D. Shojai New Choices in Natural Healing for Dogs and Cats (Rodale Press, 1999).